As an IRS Enrolled Agent (EA), I am licensed by the US government to represent Orange County taxpayers before the IRS, release and remove your tax levy and wage garnishment, settle your debt, prepare your back taxes, and help you achieve a fresh start. I work personally and confidentially with every client at a reasonable flat fee quoted up front and will get you the same resolution and relief as high-cost tax attorneys one would find in Newport Beach, Laguna Beach, or Irvine who charge $300–$1,000 per hour. More people live in OC than 21 US states—about three million people. This includes residents of Brea, Yorba Linda, Fullerton and La Habra in the north; San Clemente, San Juan Capistrano, and Dana Point in the South; Newport Beach, Huntington Beach, and Seal Beach in the west; Lake Forest, Mission Viejo, and Rancho Santa Margarita in the East; and Santa Ana, Costa Mesa and Irvine in the center—just to name some of the beautiful cities of this region. 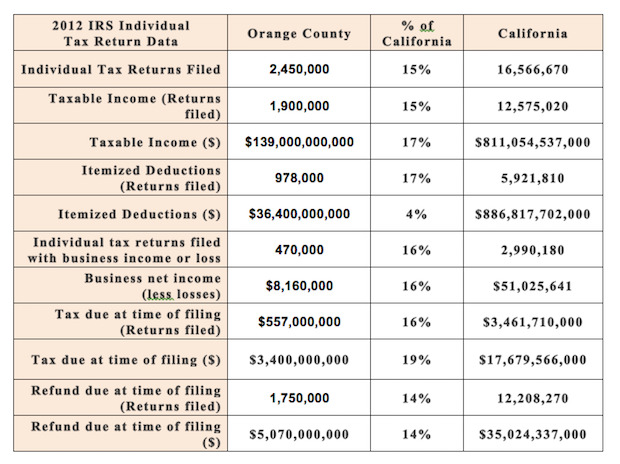 It is certain that several thousand residents throughout Orange County have IRS problems, such as tax levies, wage garnishments, property seizures, past due tax returns, unfiled taxes, and IRS tax audits. In its business economy, the county has a very low unemployment rate of 4% and added 55,000 jobs in the 2014-2015 fiscal year alone. That’s a lot of employers providing needed jobs, yet it is also certain that some of these business owners need tax liens or levies removed or have received audit notices by the FTB, BOE, and EDD. If you have already received an IRS letter, ignoring it will only result in unnecessarily high penalties and legal costs. But you have a safe alternative—talk to me, Mike Habib, Enrolled Agent. You can remove the fear and anxiety of unfiled back tax returns, pass through the audit process, and overcome other IRS tax problems from your life. With almost 90,000 non-family owned establishments in OC, you may feel singled out, but tax audits and levies happen to small and large businesses alike throughout California and the US. In certain cases, the BOE will allow you to offer a compromise on the amount owed. But be careful. Not all offers are accepted. Let a specialist in tax preparation and resolution for businesses with an A+ rating at the Better Business Bureau, represent your business at the BOE and negotiate a settlement on your behalf. With a total employment of about 1,350,000 OC employees, there’s a lot of possibilities for conflict with the IRS. Within 790 square miles, Orange County is home to a little over three million people, with about 1.5 million employees. This includes about 25 unincorporated areas, such as Coto de Caza, East Irvine, Ladera Ranch, Las Flores, Orange Hills, Rossmoor, Santa Ana heights, Trabuco Canyon, and Tustin Foothills, to name a few. I remove tax levies and resolve tax problems throughout these unincorporated areas and all cities of Orange County, including Anaheim, Brea, Irvine, Santa Ana, Newport Beach, Seal Beach, Laguna Hills, Tustin, Yorba Linda, Fullerton, and Lake Forest. I will help you prepare and file your back tax returns and resolve any IRS tax problems, so you can live free of fear of the IRS. While you may have heard of the Offer in Compromise (OIC), to settle your tax liabilities and even though the IRS changed the guidelines in 2012 to make it easier to qualify, you are not guaranteed acceptance. In 2014, only 40% of taxpayer who applied for OIC relief were accepted. Not only do tax payers try to negotiate these OIC agreements on their own, they also attempt to work through the IRS audit process alone. Whether it’s through the mail, at home visits, or in-office visits, IRS auditors are trained to get information from you that you do not need to give and to get dollars from you that you may not actually owe them. I will acquire a power of attorney to represent you in your place so you do not have to be intimidated or face the fear of the unknown and complicated issues involved in your tax problems. With a median household income of $75,000, Orange County residents contributes significantly to the state’s income tax revenue. The first European settlements in the OC were land grants given to Jose Manuel Nieto and Jose Antonio Yorba. Their ranches were known as Rancho Santiago de Santa Ana (which became part of the Irvine Ranch) and Rancho Los Nietos. The Nieto heirs were granted more land in 1834, which became Rancho Los Alamitos, Rancho Las Bolsas, and Rancho Los Coyotes. After the Mexican-American War, James Irvine who became part owner of Rancho Santiago de Santa Ana, bought out the other partners’ interests. His son, James Irvine Jr., incorporated the ranch into The Irvine Company. In 1959, The Irvine Company sold 1,000 acres of the ranch to the state of California for $1 to build a university. Pacific City changed its name to Huntington Beach to honor Henry Huntington, president of the Pacific Electric trolley that connected Los Angeles with Santa Ana and Newport Beach in 1904. The trolley brought much needed economic vitality to the region as well as weekend visitors from the upper echelon of early Hollywood. Santa Ana Canyon Ranch was originally a land grant to the Yorba heirs, Bernardo and Teodosio. In 1954, I-5 construction completed, just in time for Disneyland’s grand opening in 1955, which now employs about 27,000 cast members in Anaheim. While OC has many lakes, the only natural lakes are located in Laguna Beach, which are formed from groundwater rising up along an underground fault. Anyone can take their car for a ride on the Balboa Island Ferry that operates every five minutes between Balboa Peninsula and Balboa Island in Newport Beach. For a nostalgic blast to the past amidst the trendy, upscale southern OC, Old Town in the City of Orange offers residents and visitors a quaint day of shopping and eating. The most famous resident, other than possibly John Wayne and Holocaust survivor and author Corrie Ten Boone, would be Richard Nixon who was born in Yorba Linda (where his library is located) and lived in San Clemente after his presidency. Built by San Clemente founder Ole Hanson in 1926, his “Western White House” 5.4-acre estate went up for sale in April 2015 for $75 million. My office is located between the 57 and 605 freeways, near north Orange County, easy to reach via the 5, 91 and 405 freeways. I look forward to meeting you. 8SOI Tax Stats - Individual Income Tax Statistics - 2012 ZIP Code Data taken from IRS, Statistics of Income Division, Individual Master File System, updated July 2014, accessed May 12, 2015. 9These facts were gathered from Wikipedia articles on Orange County, Irvine, and Richard Nixon.